Caiman free games: Color Lines 3D by IstraSoft. The original of this software is an old DOS russian game. A Linux version of this game (KLines) is also available. The purpose of the game is to align five or more balls of the same color. The balls can be aligned horizontally, vertically or diagonally. 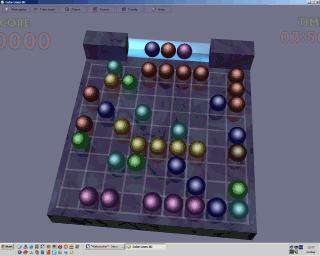 Each turn allows the player to move a ball to another cell. If a move does not align five or more balls, three random balls are added to random cells. The colors of the next balls to	be added are shown on the glass pipe. If a move aligns five or more balls, these balls dissapear from the board and no balls are added to the board. The game is over when the board is full of balls.